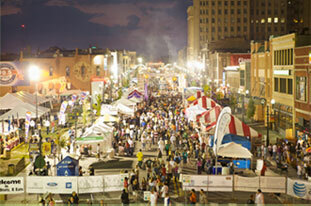 Arts, Beats, and Eats is an annual festival held in Downtown Royal Oak, not far outside of Detroit. Enjoy performances by big names in the music industry, delicious local cuisine, and an incredible art show featuring the work of artists from all over North America. The festival takes place over 4 days, and it attracts hundreds of thousands of people. Don't miss on this great event! It doesn't matter what you're interested in, whether it's fashion, food, music, or art, this festival has a little something for everybody. You'll have a fantastic time smelling all of the wonder cuisines, taking in the views, shopping at the venues, and dancing to some class acts! All of this can be made better with a party bus or limousine rental. There's so much to see and do at Arts, Beats, and Eats, the last thing you want to do is deal with traffic on top of it! A limousine or party bus rental will certainly make all of the difference in your night out at Arts Beats and Eats. Finding a designated driver is a thing of the past when you have amazing transportation to depend on! Plus, you can enjoy drinks at the interior bar areas with the neon lighting washing over you. Be sure to bring your favorite music to plug into the iPod adaptable speaker system. It only gets better from here!